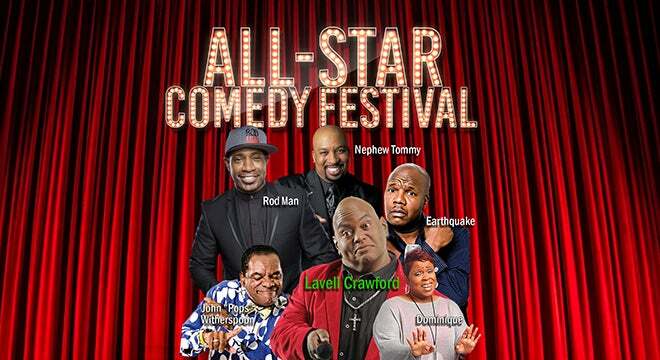 “All-Star Comedy Festival” featuring comedians Lavell Crawford, Earthquake, Nephew Tommy, John “Pops” Witherspoon, Rod Man and Dominique will perform at the Fox Theatre on Saturday, December 8 at 8 p.m. *Lineup is subject to change. Comedian Lavell Crawford gained huge national exposure on NBC’s hit reality series Last Comic Standing. Not only did NBC take notice, promptly signing Lavell to a holding deal with the network, but also Comedy Central, offering him his own half-hour standup special, Comedy Central Presents: Lavell Crawford. He appeared on the crime drama series Breaking Bad and has reprised his role on Better Call Saul as Saul Goodman’s bodyguard Huell Babineaux. Comedian Earthquake, known by his fans as “Quake,” is beloved in the stand-up comedy arena. Known for years as “The Comedian's Favorite Comedian,” his numerous television appearances on HBO, Comedy Central, BET, Showtime and the late-night talk show circuit have won him a loyal fan base. Chosen by Whoopi Goldberg for a stand-up comedy segment of The View, Earthquake has secured a place in the heart of comedy lovers across race, culture or social status. Earthquake hosts Quake’s House weekdays from 4-6 p.m. ET on Kevin Hart's Laugh Out Loud Radio, SiriusXM channel 96. Thomas “Nephew Tommy” Miles has built a career that encompasses radio, television, film and more. Thomas’ role as co-host of the nationally syndicated Steve Harvey Morning Show puts him in front of a live radio audience of more than eight million listeners daily. Nephew Tommy provides a key role in the morning show, lighting it up with his own cast of colorful characters and zany humor. In October 2010, Thomas recorded his one-hour special at the famed Motor City Casino in Detroit. Detroit native John “Pops” Witherspoon’s work spans over four decades and includes blockbuster movies, hit-television shows, commercials and top-rated music videos. He appeared as Ice Cube’s outrageously funny, dog-catching dad in New Line Cinema’s smash urban trilogy Friday, Next Friday and Friday After Next, as “Pops” on the long-running syndicated sitcom The Wayans Brothers and Lloyd on Adult Swim’s Black Jesus. His scene-stealing roles in Boomerang, Little Nicky, House Party, Vampire in Brooklyn and I’m Gonna Git You Sucka have made him one of the most memorable funny men in America. Best known as the winner of Last Comic Standing Season 8, comedian Rod Man is truly a gem in the world of standup comedy today. His unique delivery and voice capture the attention of audiences. Throw in his laid-back style, southern charm, wit, and ability to find the funny in everyday life, and you have the ingredients for a future comedy star in the making. Rod Man has made many television appearances, including The Bad Boys of Comedy for HBO, Martin Lawrence’s First Amendment for Starz, Nick Cannon’s Wild ‘N Out for MTV, One Mic Stand for BET, The Funny Spot for TV One and The World Stands Up for BBC America. He even co-hosted a morning drive-time show in Los Angeles on Stevie Wonder-owned KJLH Radio 102.3 FM. From headlining comedy clubs, to showing-out on television, Dominique is the new face of funny in America. She’s created laughs on stages across the world, including NBC’s Last Comic Standing, HBO’s Def Comedy Jam, Comedy Central’s The Chapelle Show, O.W.N’S Herlarious and Black Jesus on Adult Swim. In addition to stand-up and television, the Washington D.C. native has drawn laughs from radio audiences across America from appearances on the Tom Joyner Morning Show. From this platform, Dominique became known as the “people’s champ,” a comedian who speaks for the common man and woman of America.